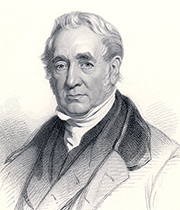 'Father of railways' George Stephenson created the railway system we know today. The story of his life parallels the rise and fall of Railway Mania in Britain in the 1830s and 40s. His best-known works include the world's first steam-powered permanent public line, the Stockton & Darlington Railway, and its first engine Locomotion No.1, plus the world's first intercity line, the Liverpool & Manchester Railway (L&MR) — including its groundbreaking infrastructure: tunnels, bridges, viaducts and the crossing of Chat Moss. A self-taught intuitive engineer with outstanding mechanical abilities, Stephenson's career began in north country coal mines, working with steam pumping and haulage engines. These he improved, eventually building his own steam locomotive — Blücher, the first locomotive to propel itself along rails by the friction of its wheels alone. Stephenson led the industry through vision and determination. He set up the first-ever factory dedicated to the construction of locomotives and track, Robert Stephenson & Company, with his son Robert Stephenson (1803-59) at the Forth Street works in Newcastle upon Tyne. The tracks laid for the L&MR would become the dimensional standard for the UK — known as standard guage. The Stephenson name is also remembered for the Rainhill Trials, a competition held by the L&MR to test the reliability and speed of steam locomotives. Rocket, designed by Robert with input from George and now in London's Science Museum, won the day. Friendly, outgoing and pragmatic, Stephenson was a legend in the North during his lifetime. While his lack of formal education, involvement in manufacturing and forceful character alienated some mainstream civil engineers (not helped by his Geordie accent), he was nonetheless in constant demand. In later years, at a public meeting in Newcastle, Stephenson said of his life, "I have mixed with a greater variety of society than perhaps any man living. I have dined in mines among miners, and I have dined with kings and queens and with all grades of the nobility, and have seen enough to inspire me with the hope that my exertions have not been without their beneficial results — that my labours have not been in vain". His 20th century biographer, Hunter Davies (b.1936), described him as "one of the greatest ever Britons", and his enduring place in the minds of his countrymen was evident in 2002, when he was named in the BBC's list of 100 Greatest Britons. George Stephenson's Locomotion No.1 and her coal tender, Experiment. 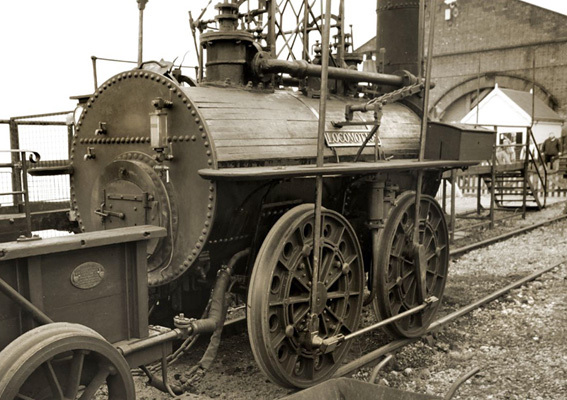 The first steam locomotive to pull a passenger train on a public railway — the Stockton & Darlington Railway.